Hollywood's highest paid actress and often cited as the world's "most beautiful" woman, Angelina Jolie opted to lose her two breasts rather than lose her life to breast cancer. The decision was made upon learning that she carries a mutation of the BRCA1 gene or breast cancer susceptibility gene, which sharply increases her risk of developing breast cancer and ovarian cancer. 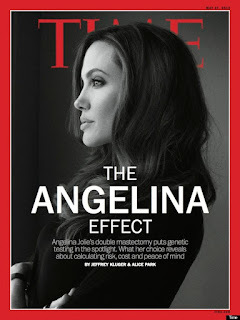 iconic beauty as Angelina, announced that she had undergone an elective double mastectomy was "a cultural and medical earthquake — a revelation so arresting it became the subject of TIME’s newest cover story." wrote Time's Jeffrey Kluger. 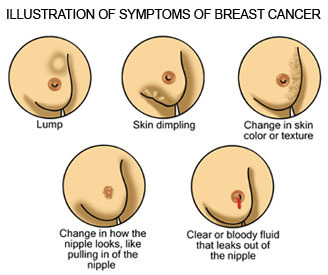 BREAST CANCER is a malignant or cancerous growth that begins in the tissues of the breast. It is a disease in which abnormal cells grow in uncontrollable way. Early stages of breast cancer may not cause any pain and discomfort but keep in mind that early detection and medical help can save life. Doing "breast-self exam" or BSE can help you lessen the probability for late stage diagnosis. Breast Cancer, an alarming fatal disease that more women suffer than men. About 4% of breast cancer cases were men so the ratio is 24:1 meaning female are more susceptible. Breast cancer is the most prevalent cancer in the world today. It is the principal cause of death from cancer among women globally. Philippines has the highest cases of breast cancer in Asia and the 9th highest incidence rate in the world. It is estimated that for every 1,800 Filipinos, one will develop cancer annually and for every 2 new cancer cases, 1 will die within a year. many breast cancers are diagnosed among 35 to 50-year old Filipino women. Also, women should watch their diet and begin to eat food that can help prevent breast cancer and other sorts of deadly diseases. Breast cancer is a deadly disease that should be addressed. It is best to take tests to ensure that one is healthy. After the operation, I now see Angelina Jolie as a role model. I commend her for being so brave in doing such preventive measure for the sake of her family, and not thinking about her career. I salute Angelina Jolie for her decision and it was brave for her to do it. I saw this in the news and she was brave enough to talk about her condition and what she went through her life. i think detection is still the best form to know if you have it or not. 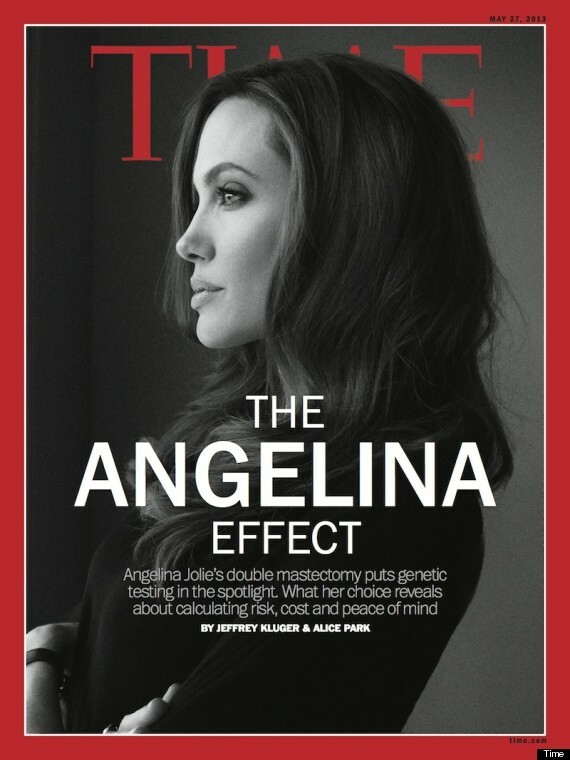 This is a good move by Angelina and helps raise awareness for breast cancer. Brave Angelina Jolie to remove here breasts. My aunt died few months ago because of this. Nothing beats early detection! REALLY! BSE will also help especially to those who can't dare to go to the doctor. amazing information! angelina is indeed a magnificent exmaple and now a very respectiive human being. all the respect and being a guide on how to prevent this breast cancer and how each one can be so strong to face it. I have high praises for Angelina Jolie. Not only is she iconic. She's definitely a strong inspiration to many, especially women. I'm sure she's already gotten her reach in helping prevent breast cancer. :) I love her! I admire the lady for her courage in undertaking a double mastectomy. Of course, she has the means for it. Cancer is a dreaded disease. I hope they find a cure real soon. Elective mastectomy is not a common option taken by women so I was really surprised hearing about this. with her, she brings inspiration to fight and be aware of breast cancer..
Its more of a sacrifice for her part to have both of them removed just to make sure she can still witness her children grow as she age. I agree with Michael, she looks very beautiful, as if she didn't undergone in an operation. But serioulsy, she's very brave woman and I'm sure she inspires not only women, but also men, in the world! I like Angelina because she's a very brave woman. Though I also agree with miss Tara Woodruff, that the disease can be prevented naturally. Although I somehow agree with Tara, I don't see any problem if you have the money anyway. It may sound elitist, but Angelina Jolie just had to do what she has to so she can live a longer, healthier life. prayer and diet could have been the proactive solutions!